While climatic conditions at the camps are very difficult, the Saharawis have built their own schools and they teach their own children. They have hospitals, workshops and some gardens and keep themselves, their children and their culture alive as they await their return to their own country. The Saharawis have their own democratically elected government, the Saharawi Arab Democratic Republic (SADR), with men and women ministers and parliamentarians. Its officials run the camps. The government looks after its people and seeks the support of other nations for the proposed referendum so that the Saharawi people can return to their own country. SADR is recognised as the legitimate government of Western Sahara by at least 80 countries, most recently by the Republic of South Africa and Kenya. It is a member of the African Union. The temperature reaches 135 F in summer and drops below freezing in winter. The area is often affected by sandstorms, called siroccos, which sweep through the refugee camps without warning. Flash floods wipe out entire stretches of tents and destroy everything in their path. Here, in the southwest corner of Algeria, nearly 200,000 refugees are struggling to survive in this inhospitable part of the great Sahara Desert. 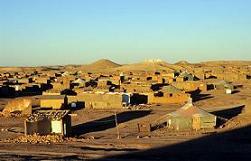 More than 80% of the Saharawi refugees living in the refugee camps are women and children. The National Union of Sahrawi Women (NUSW) is a people’s organisation of all the women of the Saharan Arab Democratic Republic SADR, created in 1979 on the initiative of the POLISARIO Front. Today the NUSW has 10,000 members in the refugee camps in Tindouf, the occupied and liberated areas of the Western Sahara and living abroad as Saharawi emigrants, organised in local and regional offices.